Rowcroft Hospice recreated an afternoon tea at the luxury Gidleigh Park hotel on its Inpatient Unit last week, enabling a group of friends to share a special celebration together. 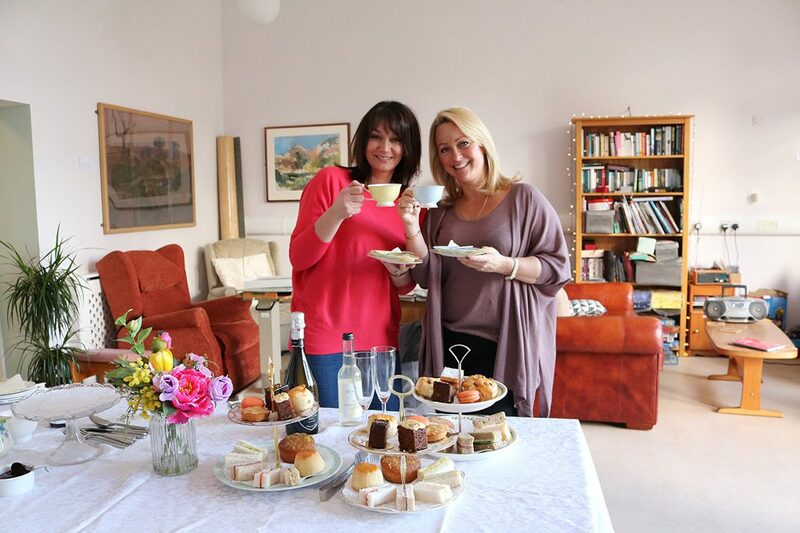 Jo Urch and Rachel Hosking asked the hospice if they would help host the tea on the Inpatient Unit when they realised their friend, Sam Crossman-Emms, who is currently being supported by Rowcroft, would be too unwell to travel to the Chagford hotel. The hospice found table cloths, cake stands and china cups while Gidleigh Park packaged up its afternoon tea for collection by the pair. Rachel explained: “Over a year ago Sam was given a champagne afternoon tea at Gidleigh Park as a gift, but unfortunately her ill health meant it was difficult to arrange a time to visit. Gidleigh had been brilliant but when we realised it wouldn’t be possible for Sam to travel we thought…let’s bring Gidleigh to Rowcroft for the day! Sue Harvey, Rowcroft’s Inpatient Unit Manager, added: “Rowcroft’s aim is to make every the day the best day possible for patients staying on our Inpatient Unit, or being supported by staff and volunteers in their own homes. Paul Shanahan, General Manager at Gidleigh Park, added: “When Rachel asked us if it would be possible to organise an afternoon tea at Rowcroft Hospice, as their friend was not able to travel to the hotel, we embraced the challenge and were all determined to make it as memorable as possible. Rowcroft is now inviting other businesses in a position to provide experiences for the hospice’s patients and their families to get in touch. Sue explained: “Where possible and appropriate, we would be delighted to enable more of our patients and their families to make precious memories together during some of the most challenging and difficult days of their lives.